It only takes a few seconds to see that love between a mother and child transcends species. When people in Kenya noticed a baby elephant with a poacher's snare around his ankle in October, they reported that the calf needed help. 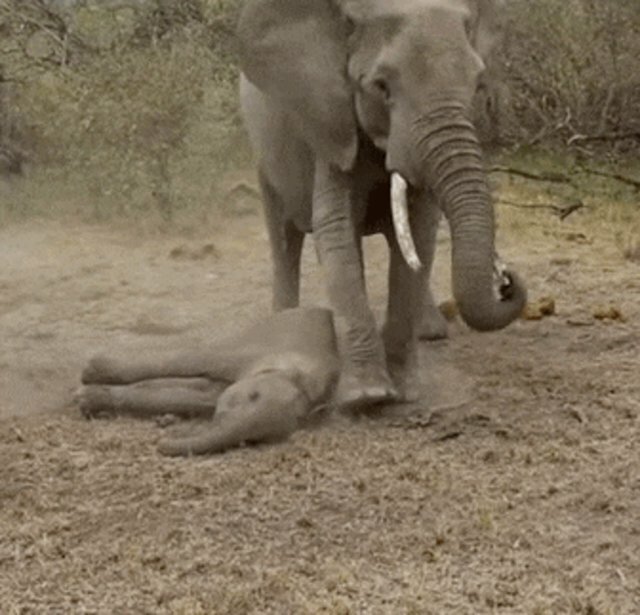 The Olare Motoragi Conservancy dispatched rescuers to locate the calf - and they found him being protected by a herd of 23 elephants, including his deeply devoted mother. 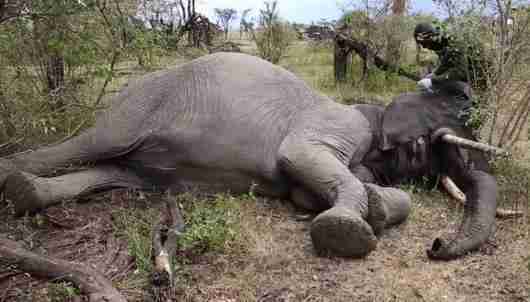 The rescue would be complicated, so rescuers called on the David Sheldrick Wildlife Trust (DSWT), which sent a veterinarian via Sky Vet, a program in partnership with the Kenya Wildlife Service (KWS) that flies expert veterinarians to help African wildlife in peril. A vet got on a plane that same day to relieve the baby elephant. 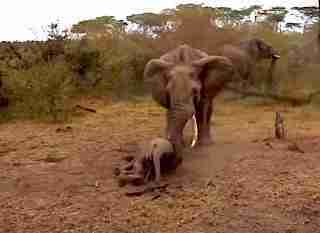 "Given that the mother was very protective of her calf, it was decided that both mother and calf should be darted," a representative for DSWT told The Dodo. After the vet darted the calf, a few heartbreaking moments, caught on camera, began - the mother, fearing the worst, desperately tried to revive her sleeping calf. 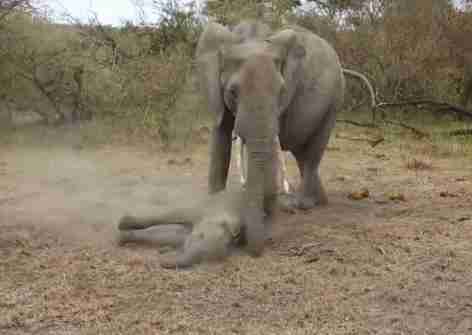 Rescuers darted the loyal mother to keep her calm while they treated her baby. "The baby is not in any danger and is simply succumbing to the anesthetic. 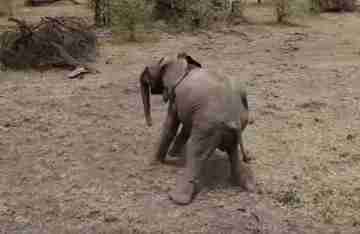 Her actions are demonstrative of her protective behavior but the calf is not in danger at this moment," the DSWT said. Sometimes, if a baby elephant becomes injured by a snare, he can't keep up with the herd and is lost in the wilderness - so it was of the utmost importance that rescuers remove the snare quickly, before the herd moved on. Rescuers cut the snare from the calf's leg with a wire cutter, and both mother and baby soon woke up and happily rejoined their herd. 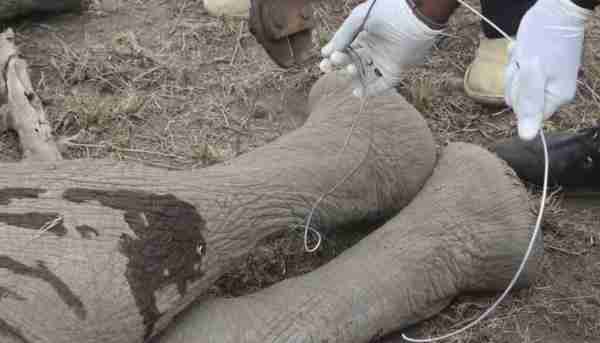 "Though AK47s and cyanide poison might be the most recently reported weapons of choice for elephant poachers, snares cause much suffering and a terrible and painful death," according to DSWT. "They are indiscriminate and much easier to obtain than firearms." Anti-poaching teams in the area have confiscated more than 135,000 snares that have been laid by bush-meat poachers and ivory poachers to date.